The study by researchers at the Federal University of São Paulo (UNIFESP) and the Federal University of Pará (UFPA) in Brazil identified possible therapeutic effects of this pigment and of other bioactive compounds found in food on stomach cancer, the third and fifth most frequent type of cancer among Brazilian men and women, respectively. The study was part of a Thematic Project supported by FAPESP. Its findings have been published in the journal Epigenomics. “We undertook a vast review of the scientific literature on all nutrients and bioactive compounds with the potential to prevent or treat stomach cancer and found that curcumin is one of them,” Danielle Queiroz Calcagno, a professor at UFPA and first author of the study, told Agência FAPESP. According to Calcagno, who conducted postdoctoral research at UNIFESP with a scholarship from FAPESP, compounds such as cholecalciferol (a form of vitamin D), resveratrol (a polyphenol) and quercetin can prevent or combat stomach cancer because they are natural regulators of histone activity. Histones are proteins in cell nuclei that organize the DNA double helix into structural units called nucleosomes. Each nucleosome is made of DNA coiled like a spool around eight histone proteins (a histone octamer) to compact the DNA so that it fits in the cell, where it is packaged into chromatin. “If the histones are acetylated, for example, the chromatin will be less condensed, and a gene in a region of the DNA segment inside it will be available to be expressed. In contrast, if the histones aren’t acetylated, the chromatin will be more condensed, and the gene won’t be expressed,” Calgano explained. Research conducted in recent years has suggested that posttranslational histone modification causes alterations in gene expression without affecting the DNA sequence. These epigenetic variations influence the development of different types of cancer. To determine whether this hypothesis also applied to stomach cancer, several groups of researchers coordinated by Marília de Arruda Cardoso Smith, a professor at UNIFESP, studied histone acetylation patterns in stomach cell samples from healthy individuals and patients diagnosed with stomach cancer. The researchers found that the cells from stomach cancer patients displayed alterations in the pattern of expression of histone acetyltransferases (HATs) and histone deacetylases (HDACs). These alterations are epigenetic and affect the structure and integrity of the genome in many tumors, including stomach cancer. Because recent research has also shown that nutrients and bioactive compounds can regulate the activity of HATs and HDACs, the scientists at UNIFESP and UFPA set out to identify any that might influence histone acetylation and hence help prevent stomach cancer or even treat the disease. “These compounds can favor the activation or repression of genes involved in the development of stomach cancer by promoting or inhibiting histone acetylation,” Calcagno said. Curcumin, for example, influences histone modifications primarily by inhibiting HATs and HDACs to suppress cancer cell proliferation and induce apoptosis (programmed cell death). Garcinol, whose chemical structure resembles that of curcumin, inhibits HATs and helps prevent stomach cancer by neutralizing free radicals. “We now plan to clarify the anticancer and epigenetic effects of bioactive compounds derived from plants in the Amazon, such as açaí [Euterpe oleracea] and nanche or hogberry [Byrsonima crassifolia], with a view to their future use in the prevention and treatment of stomach cancer,” Calcagno said. The Epigenomics article “Role of histone acetylation in gastric cancer: implications of dietetic compounds and clinical perspectives” (DOI: 10.2217/epi-2018-0081) by Danielle Q. Calcagno, Fernanda Wisnieski, Elizangela R. da Silva Mota, Stefanie B. Maia de Sousa, Jéssica M. Costa da Silva, Mariana F. Leal, Carolina O. Gigek, Leonardo C. Santos, Lucas T. Rasmussen, Paulo P. Assumpção, Rommel R. Burbano and Marília A. C. Smith can be retrieved from www.futuremedicine.com/doi/abs/10.2217/epi-2018-0081. The tropical forests of the Andes and Brazil’s Atlantic Rainforest biome are separated by almost 1,000 km of drier areas with open vegetation in the Chaco, Cerrado (Brazilian savanna), and Caatinga (Brazilian semiarid) biomes. Today, these tropical forests are not connected, but the fact that they share closely related species and lineages suggests that these biomes were connected in the past. For example, 23 rainforest bird species have been found in both the Andean and Atlantic tropical forests. The study was part of a research project conducted by Gustavo Cabanne, an ornithologist at Argentina’s Museum of Natural Sciences (MACN), in collaboration with Cristina Yumi Miyaki, a professor at the University of São Paulo’s Bioscience Institute (IB-USP) in Brazil. Results of the study were published in the journal Molecular Phylogenetics and Evolution. The team was supported by FAPESP via the FAPESP Research Program on Biodiversity Characterization, Conservation, Restoration and Sustainable Use (BIOTA-FAPESP), by Brazil’s National Council for Scientific and Technological Development (CNPq), and by Argentina’s National Scientific and Technological Research Council (CONICET). Biogeography studies the relationships among living beings, latitude, elevation and climate over time. Paleobiogeography focuses on species distribution and relationships in remote epochs. An understanding of the paleobiogeography of the species that inhabit certain biomes in the present can help scientists infer the distribution of these same biomes in the past. “The main challenge in biogeographical research is integrating and interpreting the information obtained from several sources, such as data on biological components and genomes for the species analyzed, geology and paleoclimate, palynology [pollen and spores], and even remote sensing data from satellite imagery,” Miyaki said. This is a map showing the location of the Cerrado ecoregion as delineated by the World Wide Fund for Nature . “In this past biogeographical context, the Andean and Atlantic tropical forests may have served as refugia. Their dynamic history [connection and isolation cycles] may have been an important driver of speciation in the Neotropics [a region comprising Central and South America, the Caribbean and parts of Mexico and the United States],” Cabanne said. “S. rufosuperciliata is an appropriate model with which to explore the Andean-Atlantic forest connection because it inhabits both the main forest domains and the areas that could have been directly involved in bridging them: the gallery forests of the eastern Chaco and some parts of the southern Cerrado,” Cabanne said. “Our findings are consistent with studies of other organisms and may indicate a more general pattern of connectivity among biomes in the Neotropics,” Miyaki added. In addition, this new study and previous research by the same group “point to high levels of cryptic diversity [meaning morphologically similar but genetically diverse species] between the Andes and Atlantic Rainforest biomes and suggest that the Andean population of S. rufosuperciliata should be recognized as an independent species”, Cabanne added. Citation: Phylogeographic variation within the Buff-browed Foliage-gleaner (Aves: Furnariidae: Syndactyla rufosuperciliata) supports an Andean-Atlantic forests connection via the Cerrado. Now, a pair of research papers published the week of April 22 from the University of Washington — one in the Journal of Neuroscience, the other in the Proceedings of the National Academy of Sciences — use functional MRI to identify two differences in the brains of blind individuals that might be responsible for their abilities to make better use of auditory information. 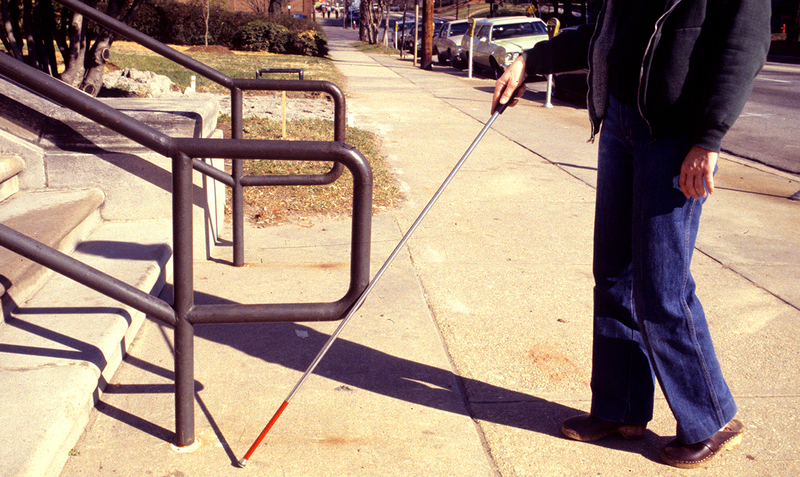 “There’s this idea that blind people are good at auditory tasks, because they have to make their way in the world without visual information. We wanted to explore how this happens in the brain,” said Ione Fine, a UW professor of psychology and the senior author on both studies. Instead of simply looking to see which parts of the brain were most active while listening, both studies examined the sensitivity of the brain to subtle differences in auditory frequency. “We weren’t measuring how rapidly neurons fire, but rather how accurately populations of neurons represent information about sound,” said Kelly Chang, a graduate student in the UW Department of Psychology and lead author on the Journal of Neuroscience paper. That study found that in the auditory cortex, individuals who are blind showed narrower neural “tuning” than sighted subjects in discerning small differences in sound frequency. “This is the first study to show that blindness results in plasticity in the auditory cortex. This is important because this is an area of the brain that receives very similar auditory information in blind and sighted individuals,” Fine said. “But in blind individuals, more information needs to be extracted from sound — and this region seems to develop enhanced capacities as a result. The second study examined how the brains of people who are born blind or become blind early in life — referred to as “early blind” individuals — represent moving objects in space. The research team showed that an area of the brain called the hMT+ — which in sighted individuals is responsible for tracking moving visual objects — shows neural responses that reflect both the motion and the frequency of auditory signals in blind individuals. This suggests that in blind people, area hMT+ is recruited to play an analogous role — tracking moving auditory objects, such as cars, or the footsteps of the people around them. The paper in the Journal of Neuroscience involved two teams — one at the UW, the other at the University of Oxford in the United Kingdom. Both teams measured neural responses in study participants while participants listened to a sequence of Morse code-like tones that differed in frequency while the fMRI machine recorded brain activity. The research teams found that in the blind participants, the auditory cortex more accurately represented the frequency of each sound. Left: Researchers began by measuring responses in the auditory cortex to find a map of how frequency responses were represented in the brain. The warm colors represent regions of the brain that showed the greatest response to low-pitched tones, while blue colors represent regions that responded more to high-pitched tones. Right: When researchers examined the range of frequencies each vertex of the brain was selective to, they found tuning tended to be narrower for blind individuals, which may underlie the enhanced ability of blind individuals to pick out and identify sounds in the environment. The Proceedings of the National Academy of Sciences study examined how the brain’s “recruitment” of the hMT+ region might help blind people track the motion of objects using sound. Participants once again listened to tones that differed in auditory frequency, but this time the tones sounded like they were moving. As has been found in previous studies, in blind individuals the neural responses in area hMT+ contained information about the direction of motion of the sounds, whereas in the sighted participants these sounds did not produce significant neural activity. By using sounds that varied in frequency, the researchers could show that in blind individuals, the hMT+ region was selective for the frequency as well as the motion of sounds, supporting the idea that this region might help blind individuals track moving objects in space. “These results suggest that early blindness results in visual areas being recruited to solve auditory tasks in a relatively sophisticated way,” Fine said. This study also included two sight-recovery subjects — individuals who had been blind from infancy until adulthood, when sight was restored via surgery in adulthood. In these individuals, area hMT+ seemed to serve a dual purpose, capable of processing both auditory and visual motion. 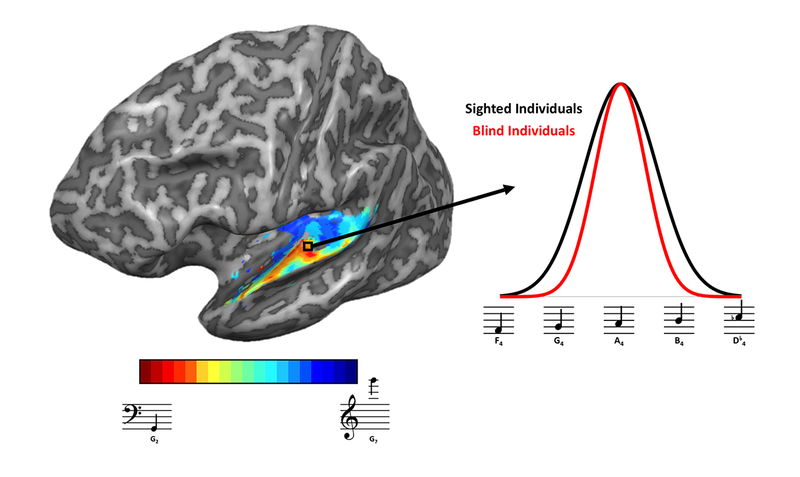 The inclusion of people who used to be visually impaired lends additional evidence to the idea that this plasticity in the brain happens early in development, Fine said, because the results show that their brains made the shift to auditory processing as a result of their early-life blindness, yet maintains these abilities even after sight was restored in adulthood. Both studies were funded by the National Eye Institute and the National Institutes of Health. The Proceedings of the National Academy of Sciences study was co-authored by Elizabeth Huber of the UW and Fang Jiang of the University of Nevada, Reno. The Journal of Neuroscience study was co-authored by Chang and Huber, as well as Ivan Alvarez, Aaron Hundle and Holly Bridge of the University of Oxford. Artificial muscles can grow stronger by working out just like real muscles. A mechanically-trained artificial muscle resists damage (crack) propagation using aligned nanofibrils, a similar fatigue-resistant mechanism as in skeleton muscles. Two species of vulture—the turkey vulture and the black vulture—are able to coexist because their respective traits reduce the need for them to compete for nutritional resources, according to a study by University of Georgia researchers. In the ecosystem, vultures serve as garbage disposals, eliminating rotting flesh and reducing the spread of diseases. For example, in Asia population declines in vultures have given rise to diseases like rabies. Both turkey and black vultures discover and partake in this feast. A team of UGA researchers investigated how the turkey vulture and the black vulture—which have similar outward appearances—are able to coexist in a geographic region based on unique physical traits, skills and behavioral characteristics. The team was led by Mike Byrne, a postdoctoral researcher at the Savannah River Ecology Laboratory at the time of the study. Rabbit and pig carcasses were placed as bait in open canopy and forested habitats. Byrne used an advanced GPS tracking system with high-resolution capability and remote cameras to examine the birds’ foraging behavior and movement patterns. The turkey vulture’s body mass relative to its wing surface area is much lighter than a black vulture’s, according to Byrne, now an assistant professor of wildlife ecology at the University of Missouri. This physical trait allows them to soar more efficiently than black vultures, enabling them to cover a larger land mass and zoom in on small carcasses. Their keen sense of smell, coupled with their flight skills, means that they’re the first to arrive at the buffet. The study revealed that turkey vultures arrived first at 94% of the carcasses. But black vultures are adept at foraging larger carcasses, and they have other traits that allow them to successfully compete with turkey vultures, according to James Beasley, Byrne’s supervisor at the time of the study. Understanding how functionally similar vulture species are able to coexist can provide insight to European conservationists, who are using feeding programs to offset population declines, the researchers said. Additional authors on the study are Amanda Holland, University of Georgia’s Savannah River Ecology Laboratory, Aiken, South Carolina; College of Forestry, Oregon State University, 3100 SW Jefferson Way, Corvallis, Oregon, 97333; Kelsey Turner, SREL; Warnell School of Forestry and Natural Resources; USDA-APHIS-WS, 400 Northeast Drive, Suite L, Columbia, South Carolina, 29203; and Albert Bryan, SREL. Researches used CRISPR to create albino brown anole lizards. The team’s results, which appeared online March 31, have been submitted for peer review. Gene manipulation using CRISPR typically involves injecting gene-editing solutions into an animal’s newly fertilized egg or single-cell embryo, causing a mutation in the DNA that is reproduced in all subsequent cells. However female reptiles can store sperm in their oviducts for long periods, making it difficult to pinpoint the exact moment of fertilization. Also, the physiology of their fertilized eggs, which have pliable shells with no air space inside, presents challenges for manipulating embryos without damaging them. Ashley Rasys holds one of the lizards on her fingertip. Menke, who typically studies mice, said he chose brown anoles because they essentially represent a reptilian counterpart to Darwin’s famous Galapagos finches—the lizards are spread throughout the islands of the Caribbean, with distinctive traits arising among each island’s relatively isolated population. Leg size, for example, is highly variable among different species of anoles, with ground-dwelling species possessing big and strong legs adapted to running and leaping, while their tree-dwelling cousins have smaller legs that are more agile for limb-hopping. The lizards for this study were all collected from the wild in an area near Orlando, Florida. The ability to study the genes of brown anoles could also have implications for human genetics work. The tyrosinase gene is required for certain aspects of eye development shared between humans and anoles, but absent in the eyes of mice and other organisms commonly used for biomedical research. Researchers looking to explore ways to manipulate this gene for human ocular health did not have a suitable animal model—until now. With its three planets orbiting two suns, Kepler-47 is the only known multi-planet circumbinary system . Circumbinary planets are those that orbit two stars. This discovery cements the system's title as the most interesting of the binary-star worlds, and marks the first complete and dynamically full planetary system around a binary star. 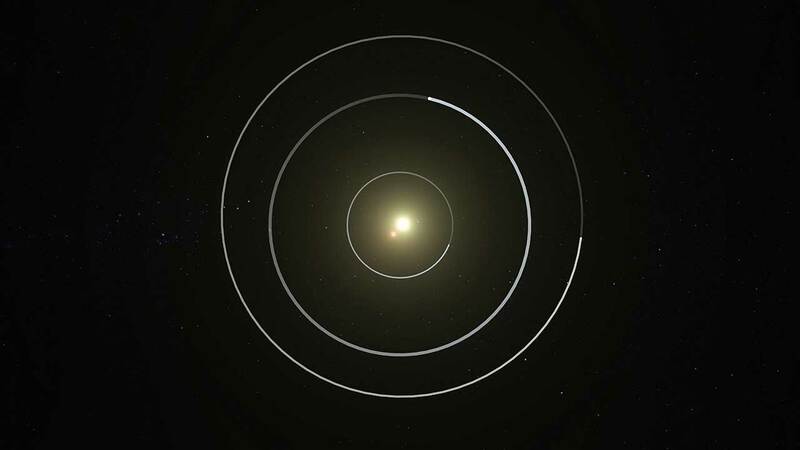 Animation showing the orbits of the three planets in the Kepler 47 system. With its three planets orbiting two stars, Kepler-47 is the only known multi-planet circumbinary system. The orbit of the outer planet of this system falls well within the binary's habitable zone, the region where an Earth-like planet could maintain liquid water on its surface. The planets in the Kepler-47 system were detected via the transit method. This method relies on small decreases in the measured brightness of a star (or, in this case, a pair of stars), when a planet passes in front of the star as seen from Earth. The newly discovered planet, dubbed Kepler-47d, was not detected earlier because its distance from its host stars means it produces only a tiny transit signal. "We saw a hint of a third planet back in 2012, but with only one transit we needed more data to be sure," said SDSU astronomer Jerome Orosz, the paper's lead author. "With an additional transit, the planet's orbital period could be determined, and we were then able to uncover more transits that were hidden in the noise in the earlier data." Artist's depiction of the relative sizes of the three planets in the Kepler-47 system. The large middle planet is the newly discovered planet, Kepler-47d. As is common with circumbinary planets, the alignment of the orbital planes of the planets changes with time. In this case, the middle planet's orbit was not aligned during the first two years of operation of the Kepler Space Telescope. In 2012, astronomers saw a hint of the existence of a third planet in the data. As the orbit of the third planet became more aligned, stronger transit signals were detected, and the transits went from undetectable at the beginning of the Kepler Mission to the deepest of the three planets over the span of just four years. "In 2015, we predicted the existence of a third planet in this system on dynamical grounds. It is great to see reality matches our prediction," said Haghighipour. The inner, middle, and outer planets of Kepler-47 system are 3.1, 7.0, and 4.7 times the size of the Earth, and take 49, 187, and 303 days, respectively, to orbit around the central binary. The stars themselves orbit each other in only 7.45 days. One star is similar to the Sun, while the other has only one-third of the Sun's mass. The researchers were surprised by both the size and location of the new planet. Kepler-47d is the largest of the three planets in the Kepler-47 system. An overhead view of the orbital configuration of the Kepler-47 circumbinary planet system. "The discovery of Kepler-47d confirms two of our predictions - first, that planets form around binary stars the same way they form around single stars, and second, that they too can form complete systems", says Haghighipour, who has developed theories of planet formation and habitability in circumbinary orbits. The Kepler-47 planetary system is an example of the diversity of solar systems outside our own. Despite having two "suns", the entire system is so compact that it would fit inside the orbit of Earth. It is approximately 3340 light-years away in the direction of the constellation Cygnus. "This work builds on one of the Kepler's most interesting discoveries: that systems of closely-packed, low density planets are extremely common in our galaxy," said University of California, Santa Cruz astronomer, Jonathan Fortney, who was not part of the study. This research has been published in the Astronomical Journal, volume 157, issue 5, article 174, doi: 10.3847/1538-3881/ab0ca0. 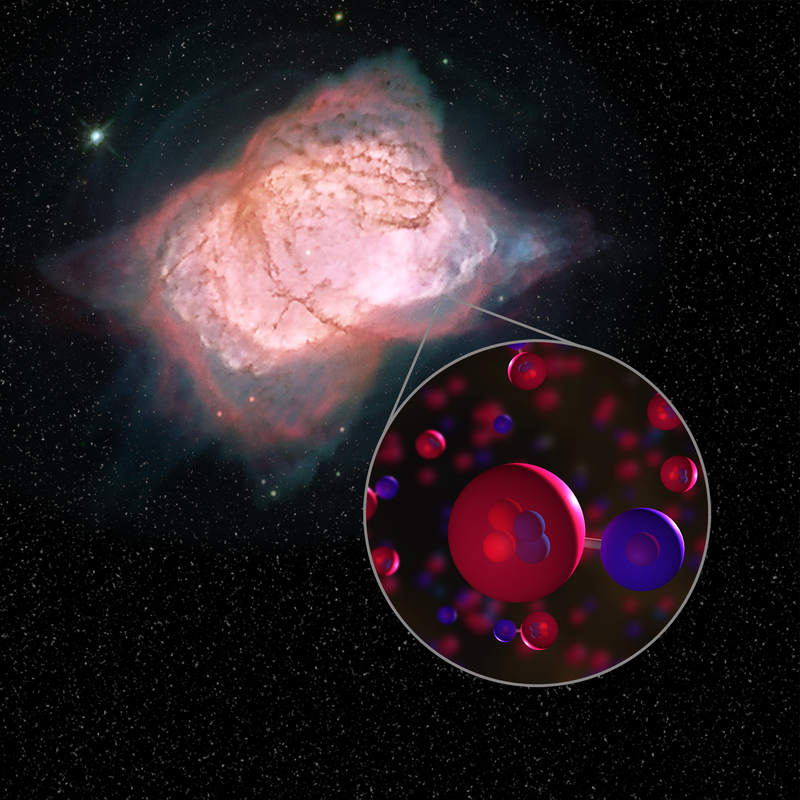 Then, in the late 1970s, scientists studying the planetary nebula called NGC 7027 thought that this environment might be just right to form helium hydride. Ultraviolet radiation and heat from the aging star create conditions suitable for helium hydride to form. But their observations were inconclusive. Subsequent efforts hinted it could be there, but the mystery molecule continued to elude detection. The space telescopes used did not have the specific technology to pick out the signal of helium hydride from the medley of other molecules in the nebula. Initially described in 1978, geomagnetic jerks are unpredictable events that abruptly accelerate the evolution of the Earth's magnetic field, and skew predictions of its behaviour on a multi-year scale. Our magnetic field affects numerous human activities, ranging from establishing the direction in smartphones to the flight of low-altitude satellites. It is therefore essential to accurately predict its evolution. Still, geomagnetic jerks have presented a problem for geophysicists for over forty years. Visualization of the interior of the Earth's core, as represented by a computer simulation model (view of the equatorial plane and a spherical surface near the inner core, seen from the North Pole). Magnetic field lines (in orange) are stretched by turbulent convection (in blue and red). Hydromagnetic waves are emitted from the inner core, and spread along the magnetic field lines up to the core's boundary, where they are focused and give rise to geomagnetic jerks. The Earth's magnetic field is produced by the circulation of matter within its metallic core, via the energy released when this core cools. Researchers know of two types of movements that cause two types of variations in the magnetic field: those resulting from slow convection movement, which can be measured on the scale of a century, and those resulting from "rapid" hydromagnetic waves, which can be detected on the scale of a few years. They suspected that the latter played a role in the jerks, but the interaction of these waves with slow convection, along with their mechanism of propagation and amplification, had yet to be revealed. To solve this mystery, Julien Aubert from l'Institut de physique du globe de Paris (CNRS/IPGP/IGN/Université de Paris) developed, with a colleague from the Technical University of Denmark (DTU), a computer simulation very close to the physical conditions of our core. The simulation required the equivalent of 4 million hours of calculation, and was carried out thanks to the supercomputers of GENCI. Researchers were subsequently able to reproduce the succession of events leading to geomagnetic jerks, which arise in the simulation from hydromagnetic waves emitted in the inner core. These waves are focused and amplified as they approach the core's surface, causing magnetic disturbances comparable in all ways to the jerks observed. The digital reproduction and comprehension of these jerks paves the way for better predictions of the Earth's magnetic field. Identifying the cause of magnetic field variations could also help geophysicists study the physical properties of the Earth's core and inner mantle. This research project was financed by the Fondation Simone et Cino Del Duca of Institut de France, which supports fundamental research in the Earth Sciences through one of its scientific grants. Sandia National Laboratories, which has made and tested hypersonic vehicles for more than thirty years, thinks artificial intelligence and autonomy could slash these weeks to minutes for deployed systems. To prove it, Sandia announced today the formation of Autonomy New Mexico, an academic research coalition whose mission is to create artificially intelligent aerospace systems. A diverse set of technologies to be developed at Sandia National Laboratories could strengthen future hypersonic and other autonomous systems. A hypersonic boost-glide vehicle — the type tested by Sandia — launches into space aboard a rocket, then detaches and uses only its momentum to sail across the upper atmosphere before finally plunging back to Earth and its target. “At extreme speeds, the flight is incredibly challenging to plan for and program,” said Alex Roesler, a senior manager at Sandia who leads the coalition. In theory, artificial intelligence could generate a hypersonic flight plan in minutes for human review and approval, and in milliseconds a semi-autonomous vehicle could self-correct in flight to compensate for unexpected flight conditions or a change in the target’s location. A human monitoring the flight could regain control by turning off the course-correcting function at any time. Autonomous technologies, such as self-driving cars, are designed to perform complicated tasks without human intervention. They require a broad range of technologies that work in tandem, including advanced computing, artificial intelligence and machine-learning algorithms, sensors, navigation systems and robotics. The Sandia-led collaboration integrates leading expertise from throughout the country in these areas with its own knowledge in high-performance flight vehicles. Sandia makes hypersonic glide vehicles for research purposes and operates a hypersonic wind tunnel. Members collaborating with Sandia represent the Georgia Institute of Technology; Purdue University; the University of Illinois, Urbana-Champaign; the University of New Mexico; Stanford University; Texas A&M University; The University of Texas at Austin; and Utah State University. The coalition is converging today on the University of New Mexico campus for its first general meeting. For two days, members will present experimental results, propose new ideas and discuss progress toward their shared goals. AutonomyNM’s broader ambitions are to serve as a wellspring for other industries by developing ideas that could lead to safer, more efficient robots in, for example, autonomous transportation, manufacturing, space or agriculture. If the group reaches its goals, it will have created computing algorithms that compress 12 hours of calculations into a single millisecond, all on a small, onboard computer. A pilot flies a drone at dusk. Humans might see their roles throughout aviation and aerospace shift if Sandia National Laboratories can simplify manual tasks with artificial intelligence. Sandia is aiming to complete the foundational technologies of new autonomous flight systems by 2024. In addition to hypersonic flight systems, AutonomyNM plans to explore other applications of autonomy in aerospace, emphasizing solutions to national security challenges. AutonomyNM is partly patterned after similar collaborations formed by other government agencies, like the Defense Department. The Sandia-led organization differs in its focus on academic partnerships and its objective to develop autonomy customized for hypersonic flight. Funding for AutonomyNM research is provided by Sandia’s Laboratory Directed Research and Development and Academic Alliance programs. Imagine a future technology that would provide instant access to the world's knowledge and artificial intelligence, simply by thinking about a specific topic or question. Communications, education, work, and the world as we know it would be transformed. Would that not give humans godlike knowledge? And who would get it first? 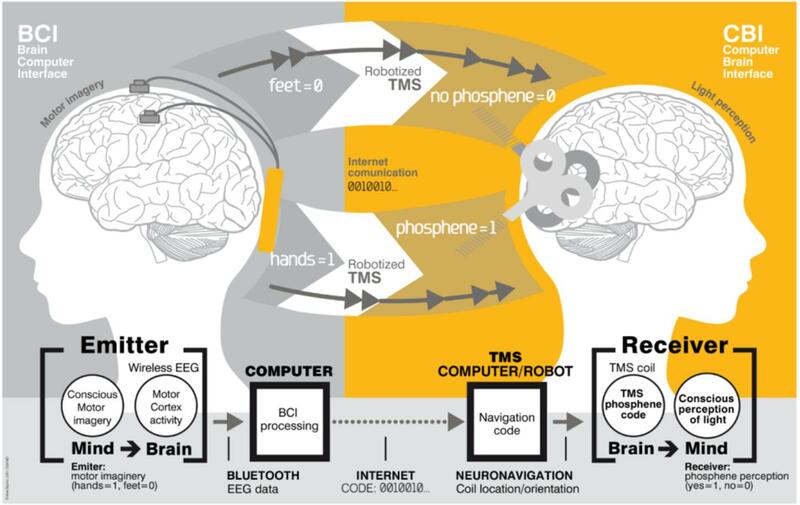 The most promising long-term future technology for non-destructive, real-time human–brain–computer interfaces and brain-to-brain communications may be neuralnanorobotics.
. Brain-to-brain interface (BTBI) for information transfer between human subjects. The emitter subject is shown on the left, where sensorimotor cortex activity was recorded using EEG electrodes. The emitter performed an imagery based binary motor task: imagery of the feet (bit value 0) versus imagery of the hands (bit value 1). The receiver subject is shown on the right. The TMS coil was positioned differently over the visual cortex for 1 and 0 bit values, and evoked or did not evoke phosphenes (flashes of light), respectively. An Internet link was used for this brain-to-brain communication. Image reproduced from Grau et al. (2014). The first reported scientific instance of the term “brain–computer interface” dates to 1973. Evidently irrational beliefs can become established in the social norms of a society. Research by biologists shows how. 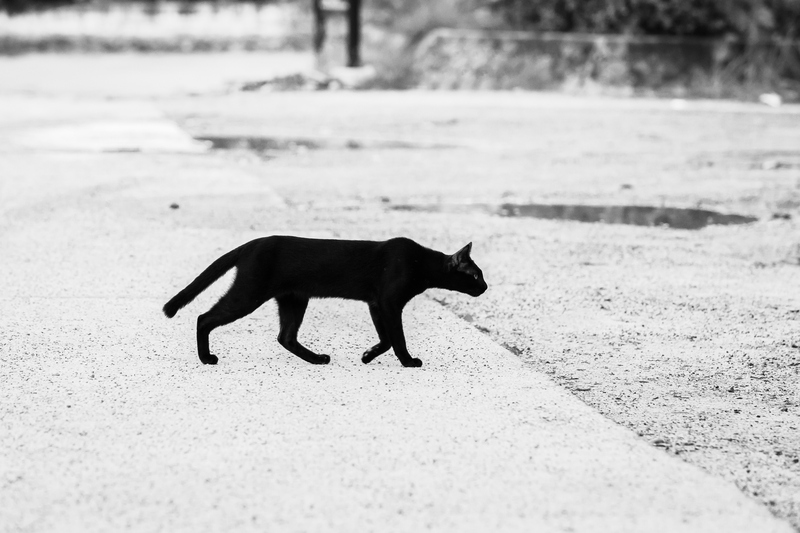 Do you change direction when you see a black cat approaching? A game theory-driven model developed by two theoretical biologists at Penn shows how such superstitions can catch on. While it’s widely recognized that superstitions like these are not rational, many persist, guiding the behavior of large groups of people even today. In a new analysis driven by game theory, two theoretical biologists devised a model that shows how superstitious beliefs can become established in a society’s social norms. Their work, which appears in Proceedings of the National Academy of Sciences, demonstrates how groups of individuals, each starting with distinct belief systems, can evolve a coordinated set of behaviors that are enforced by a set of consistent social norms. “What’s interesting here is that we show that, beginning in a system where no one has any particular belief system, a set of beliefs can emerge, and from those, a set of coordinated behaviors,” says Erol Akçay, an assistant professor of biology at Penn. 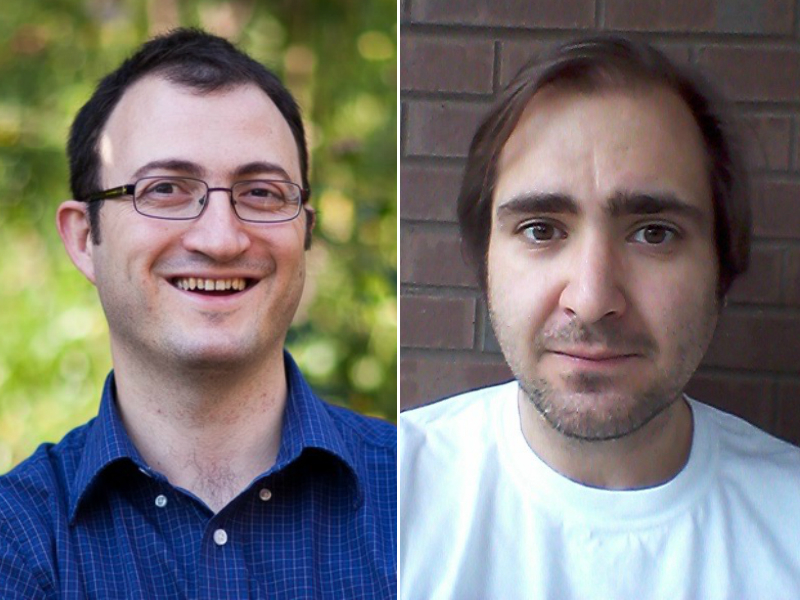 Morsky and Akçay’s work is an application of game theory, which attempts to predict how people will interact and make decisions in a social setting. They specifically considered what are known as correlated equilibria, scenarios in which all actors are given correlated signals that dictate their response to any given situation. Despite the color of a cat having no bearing on the likelihood of an approaching cyclist stopping or going, sometimes this kind of conditional strategy might result in a higher payoff to the cyclist—if it is correlated with superstitions of other cyclists. “Sometimes it may be rational to hold these irrational beliefs,” Morsky notes. In their model, Morsky and Akçay assume that individuals are rational, in that they do not follow a norm blindly, but only do so when their beliefs make it seem beneficial. They change their beliefs by imitating successful people’s beliefs. This creates an evolutionary dynamic where the norms “compete” against one another, rising and falling in prevalence through the group. This evolutionary process eventually leads to the formation of new social norms. They found that these evolutionarily stable norms, in both prescribing how an actor should behave and also describing that actor’s expectations of how others should behave, create a consistent belief system that helps coordinate the overall behavior of many actors, even if that coordination is not being directed by any outside choreographer. To further explore their findings, the researchers hope to engage in social experiments to see whether individuals might start devising their own superstitions or beliefs when none are provided. Citation: Evolution of social norms and correlated equilibria. The Gulf Coast is still suffering from the Deepwater Horizon oil spill and full recovery may take another 10 years or more. Nine years ago on April 20, 2010, crude oil began leaking from the Deepwater Horizon drilling rig into the Gulf of Mexico in what turned out to be the largest marine oil spill in history. A long-term study suggests the oil is still affecting the salt marshes of the Gulf Coast, and reveals the key role that marsh grasses play in the overall recovery of these important coastal wetlands. Photos of a heavily oiled saltmarsh in Louisiana's Barataria Bay show recovery of the plant community following the Deepwater Horizon oil spill. Conducting the study was a multi-institutional research team funded in part by the Gulf of Mexico Research Initiative, a 10-year independent program established through a $500 million financial commitment from BP. The team began sampling soon after the spill was finally contained, and continue their work today. Their most-recent article--in Estuaries and Coasts--reports on the first six and a half years of sampling post-spill. Dr. Sean Graham of Nicholls State (L) prepares to sample the marsh soil within a Louisiana salt marsh as his students work in the background. Two plants dominate healthy Gulf Coast salt marshes--the smooth cordgrass Spartina alterniflora and the black needlerush Juncus roemerianus. Also abundant on the marsh surface are single-celled, plant-like organisms that scientists collectively refer to as benthic microalgae, while a suite of small invertebrates--amphipods, copepods, nematodes, snails, worms, and others--swim, hop, and crawl among the grass blades or burrow in the underlying root zone. The researchers' early sampling showed that nearly all the plants in heavily oiled areas died, while benthic microalgae and burrowing invertebrates suffered significant reductions. Their later sampling showed that marsh recovery was led by benthic microalgae and Spartina--which began to show significant above-ground growth within two to three years. Importantly, it was only after Spartina started its comeback that recovery of the invertebrate community began in earnest. "Plants are the foundation of salt marshes," explains Johnson. "Marsh grasses facilitate colonization by burrowing invertebrates; fuel the food web, provide animal habitat, bind the soil, and slow water flow. Without plants there is no marsh, and there is no marsh recovery following a spill without plants leading the way." The team's findings have important implications for responding to any future spills. Fleeger says "our findings indicate that mitigation strategies for any future spills should include the planting of foundation species such as Spartina." Mendelssohn, a VIMS alumnus (M.A. '73), says that foundation species "enhance recovery by providing habitat and reducing sediment erosion." Over the longer term, he says, "plant growth enhances recovery by improving soil quality. Plants generate organic matter that accumulates belowground, while their roots and rhizomes release oxygen, bind sediments, and increase sediment volume. Breakdown of plant tissues also provides nutrients that further stimulate plant growth and beneficial microbial processes in the marsh." Tempering the promise of marsh recovery via planting of grasses such as Spartina is the team's discovery that heavily oiled marsh sites remained less healthy than moderately oiled and oil-free sites more than 6 years after the Deepwater Horizon spill. Heavily oiled sites still had elevated concentrations of oil and its breakdown products, and showed slower growth of black needlerush, lower production of plant detritus and below-ground organic matter, and altered soil density. Populations of worms, juvenile snails, and other small invertebrates had also failed to fully recover. Particularly troubling was the continued rarity of the polychaete worm Manayunkia aestuarina. One of the most abundant single species in the invertebrate community, this tube dweller is important to the health of marsh sediments, and plays a key role in the marsh food web as a major prey item for crabs, shrimp, and fish. "The near absence of this species could indicate significant alteration of ecological function at heavily oiled sites," says Johnson. Manisha Pant, a technician in David Johnson's laboratory at VIMS, samples the invertebrate community within a lightly oiled Louisiana salt marsh. "Previous work shows that oil spills in salt marshes can impact bottom-dwelling invertebrates for more than four decades," says Fleeger. "Long-term exposure to oil and its breakdown products may also decrease the sensitivity and resilience of these organisms to future spills," he adds. On a brighter note, a previous study by Johnson and colleagues suggests that fertilization of Spartina plantings can enhance growth of both its stems and roots, thus aiding marsh recovery in the long term. "We're starting to see the salt marsh in the Gulf of Mexico rebound," says Johnson, "but it will likely be a decade or more before we see complete recovery." This study was made available online in August 2018 ahead of final publication in print in January 2019. Wild fish purposely alert familiar fish to perils and predators with urea and other chemicals. The USask researchers discovered that wild fish release chemicals called 'disturbance cues' to signal to other fish about nearby dangers, such as predators. Fathead minnows engage in normal feeding behaviour until they sense chemicals indicating danger from others, causing them to shoal tightly together. "Disturbance cues may help to explain why some fish populations crash after they decline past a certain point," said Kevin Bairos-Novak, a graduate student member of the research team. The signals provoked a 'fright response' in fish they knew, including freezing, dashing about and then shoaling tightly together. Fish use this behavior to defend themselves against predators. "When minnows were present alongside familiar minnows, they were much more likely to produce signals that initiated close grouping of nearby fish, a strategy used to avoid being eaten by predators," said Bairos-Novak, who is now at James Cook University, Australia. "It is exciting to discover a new signaling pathway in animals," said Maud Ferrari, Bairos-Novak's supervisor and a behavioral ecologist in the veterinary college's Department of Veterinary Biomedical Sciences. "We found that fish are able to manipulate the behavior of other individuals nearby by issuing a signal."